On 16th September at Peninsula Obstacle Racing Course, Moorooduc, you can be part of an obstacle course with a difference. If you love a good chase, this one is for you. But be warned, it’s over 7km and there are around 60 obstacles! Make sure you’ve got a strong heart and plenty of stamina; these zombies are seasoned pros – and they really want your blood. You’ll be given flags that represent your precious limbs and organs. The zombies will give a good chase to take them from you, and the onus is on you to make it back to the safe zone instead of joining the undead masses. There’s a kids course for the little ones, and if the daytime doesn’t quite cut the mustard, sign up for the night course – but do expect a whole new fear level! Find out more and sign up here. If the zombie apocalypse is too terrifying for you, go for the apocalypse-light version: HvsZ. So popular is this fun-filled endeavour that it now goes by this widely recognised abbreviation. HvsZ Melbourne ran their first event in 2009, and they’ve continued to fly ever since. You can expect something like a game of tag, but where you’d normally associate this activity with screaming primary schoolers, this is between bandana-clad humans and zombies. Just in case you can’t easily tell the living from the dead, the humans wear the bandanas around their heads while the zombies tie theirs to their ankles. As is the norm, humans can be infected by zombies and will be turned. This happens when a human’s bandana is swiped and held in the tenacious grip of a zombie for three seconds. Humans don’t have to rely on their wits alone though; they have access to an entire armory with which to defend themselves against bloodthirsty advances. Weapons will include (horror of horrors) balled up socks and toy foam blasters that miraculously paralyze zombies for twenty seconds. 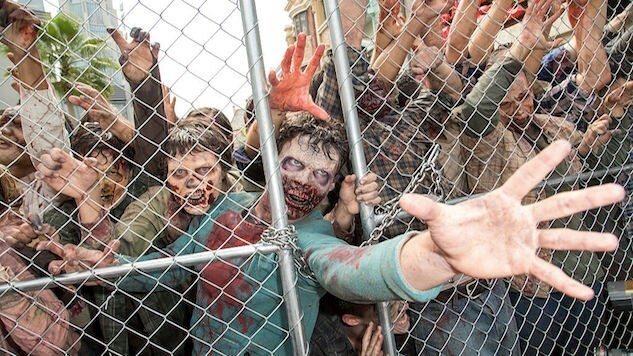 Ever wondered how to prepare for a zombie apocalypse? 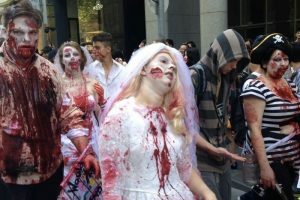 One of the best ways to familiarise yourself with the concept of the end of the world is to attend the annual Melbourne Zombie Shuffle. You have the choice of spectating or participating, but we highly recommend your full participation in this fun event. The shuffle consists of thousands of zombie enthusiasts convincingly dressed as the undead and walking the streets of Melbourne City. Many of the participants put a great deal of effort into their zombie costumes, so it’s a fabulously entertaining sight, and a whole lot of fun. You can see (or be) all kinds of zombies, from Michael Jackson’s Thriller zombies to zombie sailors, sheriffs, cheerleaders and housewives… and of course good old traditional zombies. At the end of the walk, you can expect a legendary zombie dance party. 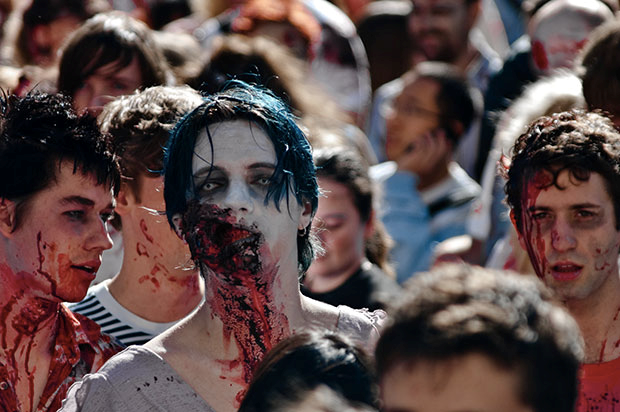 Shuffle down to Federation Square on November 4th at 2pm for the unique annual Melbourne Zombie Walk. This event, which goes on until 10pm, is co-presented by RMW Entertainment and the Brain Foundation, the latter of which will benefit from the proceeds, as well as any awareness raised. Melbourne’s version follows the success of the huge Brisbane Zombie Walk; 22,000 people rocked up for that in 2013! Given that Melbourne has an even bigger population full of lots of open-minded folk who love anything unusual, there’s a good chance that Brisbane’s 22,000 could be topped. Will you be part of the critical mass of zombies required? Zombie Outbreak is a 3D virtual reality game. Get down to Zero Latency whenever it suits to join up with fellow humans in battle with the creeping corpses and rebel raiders. The name of the game is restoring order; your team’s goal is to wind your way through the apocalyptic city streets to find a transport ship. Not so difficult, really? That’s what you think. The burning wreckage will be peppered with bloodthirsty zombies aplenty and ruthless raiders, all vying to get their hands on your mortal flesh. You’re against the clock… do you have what it takes? If so, book here. 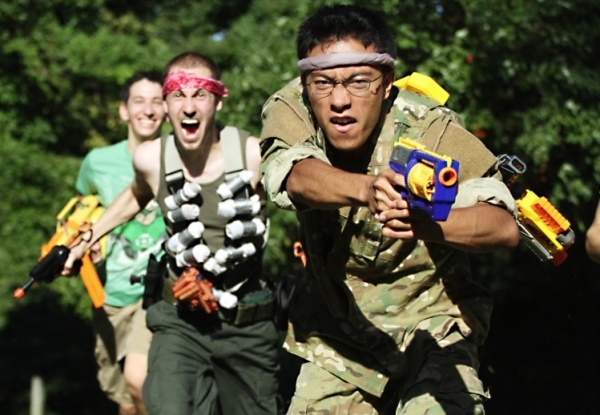 So now that you’ve been fully briefed on the forthcoming zombie outbreak in Melbourne, will you be ready? There’s only one way to be sure: make sure you’ve got all your undead and living allies together, sort your authentic apocalypse supplies at Creative Costumes and get your name down on the lists. Wishing you the best in making it through to the other side!